We are proud to present to you Daily Sabah, the latest addition to Turkey's English-language media scene. Daily Sabah will develop a local perspective to examine global issues and offer insights into Turkey's ever-changing political, economic and social landscapes. As such, we will seek to help you form better informed opinions about Turkey and portray the world as it appears from here. It is no easy task to comprehend Turkey. Many of the problems that the Turkish society still yearns to resolve date back to the Republic's formation in the early 20th century. The military elites who established this country envisioned a modern nation-state under military guardianship and created various problems that, to some degree, haunt the country to this day. Military involvement in civilian politics as well as silenced voices of devout Sunni Muslims, non-Muslim minorities, the Alevi community and the Kurds, remain largely unresolved until the 2000s. Over the past century, governments avoided tough questions and added to existing challenges. The 21st century, however, ushered in an era of dialogue as Turkey embarked on a process of political, economic and social transformation. As various groups became more vocal about equality and a more open society, political actors were forced to facilitate change and tackle chronic problems. Years of silence and repression featured a military elite who believed that they were not only able but also entitled to interfere in civilian affairs. To this end, the military overthrew elected governments at will and systematically violated citizens' human rights in the heyday of its power. In recent years, however, society-wide demands kept a lid on the military's unlawful practices and redirected its attention to national security. The atmosphere of dialogue also facilitated public debate about the persecution of devout Sunni Muslims under the old guard. The years of ultra-secularist rule systematically discriminated against millions of people with regard to public manifestations of religion and even imposed arbitrary restrictions on their political rights. Eventually all political parties yielded to popular demands –albeit in varying degrees. Similarly, non-Muslim minorities whose rights as citizens were repeatedly infringed upon have been able to celebrate their identities in an increasingly diverse society. Although much remains to be done, a promising dialogue has been established between non-Muslim minority communities and the political leadership to remedy historic injustices. Most recently, the Turkish government took initial steps to return arbitrarily seized properties of non-Muslim communities to their rightful owners. Turkey's large Alevi community faced severe discrimination amounting to massacres throughout the 20th century. The state's ultra-secularist policies targeted Alevi culture and faith by outlawing religious rituals and assimilating its followers. Nowadays, the country embarks on a difficult and undoubtedly lengthy reconciliation process with a sizeable section of its population. While the initial efforts including greater recognition and stronger dialogue give hope to many, the authorities must remain committed to the overarching goal of equal citizenship for all. Turkey's Kurds, survivors of decades of discrimination and persecution, gained much-deserved recognition from the state as equal members of society whose ethnic background is a cause for celebration, not concern. In recent years, the Turkish state succeeded in opening channels for its Kurdish citizens to express their cultural and political demands as disarmament talks between the Turkish government and the PKK leadership thus far managed to prevent violence. As Daily Sabah, we pledge to present our readership with accurate facts while remaining committed to democracy, the rule of law, human rights and liberty at a time when journalists are often tempted to manipulate, confuse and distract. We will support efforts to draft a new constitution to meet the needs of a rapidly evolving society and remain committed to Turkey's full membership in the European Union. From all of us here at Daily Sabah, I extend our greetings and look forward to meeting you six times a week. 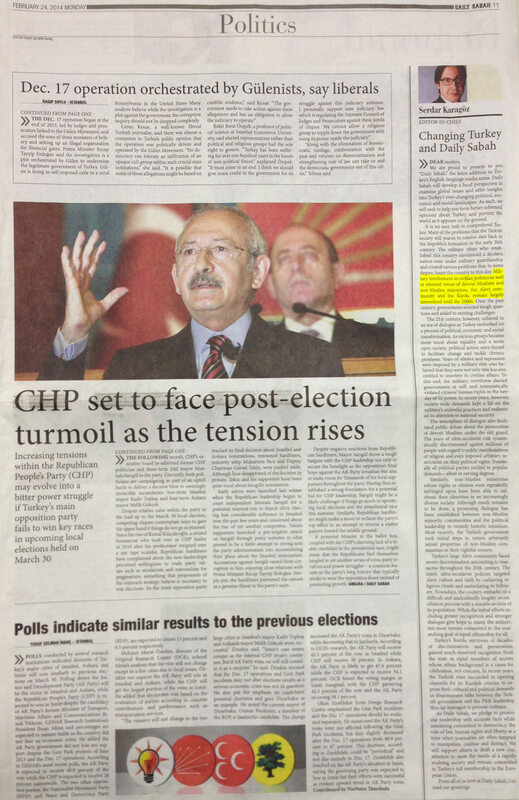 Below is an image of the original hardcopy of page 11 of Daily Sabah printed Sunday night, on Feb. 23, 2014.